Justin Lawrence recently wrote an article for the Advocate, Kentucky’s trial lawyer community’s premier publication, about what needs to be done when a person who is injured by an automobile accident, slip and fall, or workplace injury files for bankruptcy while their lawsuit is still pending. Justin regularly advises other attorneys on the best course of action to take when personal injury, workers’ compensation, social security disability, and bankruptcy claims come together, so injured men and women get the best results possible. Click here to read his article on the injured plaintiff’s bankruptcy. Does a Back Injury Qualify You for Social Security Disability Benefits? A spinal disorder can cause chronic back pain and limited mobility. Northern Kentucky and Cincinnati residents with a spinal disorder may be eligible for disability benefits. Figuring out whether your back pain qualifies you for social security disability requires a multi-step process. The most important step is the determination of whether or not your back pain meets a “listing” as determined by the Social Security Administration. What Are the Most Common Back and Spine Conditions that Lead to Disability? Northern Kentucky residents with one of these conditions should keep in mind that many of them are the natural process of aging, so there is no need to prove that you were hurt in an accident in order to get disability benefits. Also, bear in mind that the condition causing your pain has to show that the condition and its debilitating symptoms are going to last more than one year. Thus, a lumbar sprain is less likely than a herniated disc to result in disability benefits. Sprains resolve over time, while herniated discs do not. If you have one of these conditions, please call Lawrence & Associates’ Northern Kentucky office or read more from this resource. How Can an Attorney Help Me Get Disability for Back Pain? There are three main ways that an attorney can help get disability. The first is by proving that you meet a listing for spine disorders under the Social Security Administration’s regulations. If you do, then you get benefits. Meeting a listing usually is not straightforward, and requires interpretation of both your medical records and the applicable law. If you do not qualify for a listing, you can still get benefits if your residual functional capacity. Again, this requires a medical, and sometimes an expert, opinion that is best solicited from a doctor or vocational expert and filed by an attorney. It also requires an in-depth knowledge of the rules and regulations promulgated by the Social Security Administration, and it is best to have an experienced attorney research and argue these issues to the Administrative Law Judge. At Lawrence & Associates, we help Northern Kentucky and Cincinnati residents just like you get disability every day. We are Working Hard for the Working Class, and we can help you. Call us today! What Are My Chances of Being Granted Social Security Disability? The Social Security Administration keeps very good records regarding the ratio of total filers for social security disability and the total number of people that are successful. The story this number tells is not pretty. Between 2003 and 2014, only 24% of applicants were granted disability on the initial application. Even after appealing to a hearing with an Administrative Law Judge (an ALJ), only 41% of applicants nation-wide are granted disability. Although people often think that the disability system is abused, with undeserving people receiving disability, those abuses mostly ended over ten years ago. In fact, the rate of fraud is relatively low and most fraud is committed by people with actual injuries that are working on the side, rather than people who are not hurt at all but also are not working. Today it is statistically more likely than not that an applicant will never receive a disability payment! How Can I Maximize My Chances of Receiving Social Security Disability? Another way to maximize your chance of approval is to enlist your treating doctor. A good treating doctor is worth his or her weight in gold during a disability hearing. A treating doctor can write a Residual Functional Capacity report for you, which can be valuable proof of disability. The doctor may also be willing to write you a letter that you can submit to the Social Security Administration that explains your medical condition and its effect on your life in better detail than you can. Finally, the claims examiners with the Social Security Administration are trained to analyze a “typical day” in the life of an applicant and measure by hours what the applicant can or cannot do compared to what an “average” person can or cannot do. Write a letter to the examiner breaking down your day into what you think your most important limitations are. For example, can you only stand for an hour before having to rest? Make a note of that in your 24 hour chart. Someone who has to sit down frequently for rest is less hirable than someone that can stand for long periods of time. Limitations can add to up to the point where a social security disability award seems reasonable. The road to disability approval often has many stages. Giving up at any particular stage means starting all over again, so don’t let things fall by the wayside! At Lawrence & Associates, we are Working Hard for the Working Class and that means helping worthy Northern Kentucky residents get the disability they paid for through years of taxes. If you need help, call us today. 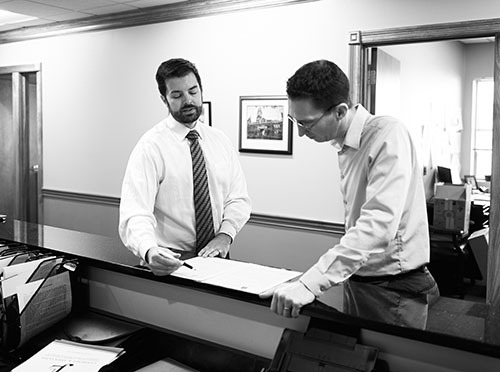 At Lawrence & Associates, many of our clients come to us with garnishments already in place. Those clients are usually at the point of desperation, because a garnishment is the death sentence for the careful balance we strike with our creditors. Suddenly, instead of staying one step ahead of the bills, we are one step behind and losing more ground every day. When a judgment results in a garnishment, it’s important to know what can be garnished and what cannot. Everyone knows that a paycheck or bank account can be garnished, and that the IRS can withhold a tax refund to repay past due income taxes from a prior year. What many Northern Kentucky residents don’t realize is that social security disability checks can also be garnished under special circumstances. First, let’s start with private – as opposed to government – debts. Generally, private creditors such as credit cards or medical providers (think Capital One or St. Elizabeth Hospital) cannot garnish social security disability benefits. They can, however, garnish bank accounts that hold these benefits if the benefits are deposited by check or if the bank that holds the disability funds is also the bank you owe money to. The amount of the garnishment depends on what kind of debt you owe. If you owe money to the IRS for back due taxes, the IRS can garnish up to 15% of your disability check. If you owe money for student loans, the government can also garnish up to 15%, although it cannot touch the first $750 of disability payments. If you owe child support or spousal support, your social security disability benefits could be garnished by as much as 50% to 65%! In Northern Kentucky, a Chapter 13 bankruptcy is a good way around a social security disability garnishment. Even the government has to obey the automatic stay, which is the bankruptcy court’s order that requires all creditors to stop collecting their debts once a bankruptcy is filed. In a Chapter 13 bankruptcy, you can pay off non-dischargeable debts – such as student loans, taxes, or child support – over a three to five year period without those debts incurring interest or penalties in the meantime. The Social Security Administration offers many kinds of benefits. Lawrence & Associates helps our Greater Cincinnati clients who have become disabled as a result of injury, disease, or age get the benefits they are owed by the Social Security Administration. The two most common types of benefits are Social Security Disability Benefits (also called DIB, SSDI or Title II benefits) and Supplemental Security Income (also called SSI or Title XVI benefits). It is important to be sure that you file for all available benefits when you first file a claim with the Social Security Administration, and hiring a knowledgeable Northern Kentucky law firm is the best way to ensure you are getting everything you deserve. It’s important to know that your social security disability attorney does not have to be paid out of pocket for his or her services. Instead, attorneys in Northern Kentucky receive 25% of your back pay from your Social Security award, usually up to a $6,000.00 limit. This is important because it gives the disabled the ability to hire an attorney to maximize their chances of success, and it ensures that the disabled will not owe an attorney money if the claim is not successful for some reason. An attorney can file a petition with the Social Security Administration for more than a $6,000 fee if a claim involves multiple hearings or appeals, but in practice this is rare. The types of conditions that are eligible for disability vary widely, and can include anything from cancer to Down’s Syndrome to orthopedic injuries. In the Greater Cincinnati area, the most common reasons to get disability tend to be: back and spinal injuries, vision loss or blindness, diabetic related conditions, loss of use of an arm or leg, anxiety, depression, and arthritis. You cannot get disability if you are still working, even if you are working in a limited capacity or with work restrictions approved by your doctor and employer.